Show + Tell: WELCOME ME TO THE 21ST c.
Ha! Ha! I love the Nick Nolte mugshot comment. 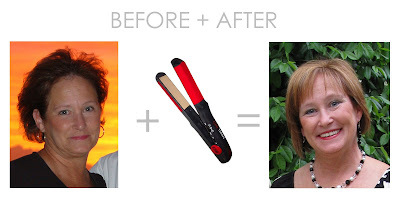 Never underestimate the power of a good flat iron. I have been a convert for a few years and I can get a few days out of a good blowout and flatiron on all my curls. Love the before and after hair! I can relate to curly vs. straight...the straight iron is the best! Sorry I will miss meeting you at the Quilt Show in Portland. I had to laugh and laugh at this post! I am Jennifer's age, and I just discovered a flat iron about a year ago. I swear it is God's gift! All of my girlfriends laughed at me when I told them about my "discovery"! There might have even been a few comments about coming out from under my rock! And the dyson! Holy toledo, batman! Totally the coolest thing ever! A friend told me that once you own a dyson you will never own another type of vacuum again. I believe it! Last week, we got a wii for the kids. Ha ha! We say it is for the kids! We are having such fun with it! Wait until you try one! Totally fun! Hugs to you and Jennifer! I graduated in 1970 when the only acceptable hair was the long, blond and straight California Girl Look. Orange juice cans and ironing my hair just never got me there. I still think of Back To The Future and if I could go back to High School I would've taken a flat iron and been beautiful and made millions. Dream on Paula!! Oh my! You are hilarious. That post had me laughing! The Chi has made my thick hair more tolerable as well-you look great!